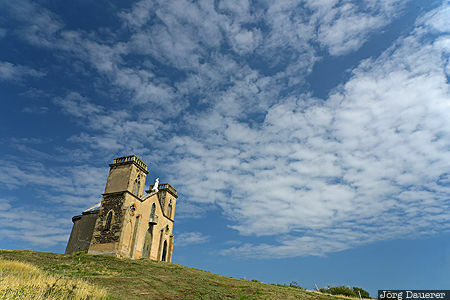 The small church Église Notre-Dame de la Salette on top of a small hill near Billom below a blue sky with some white clouds. Billom is in Auvergne in the center of France. This photo was taken at noon on a sunny day in September of 2015. This photo was taken with a digital camera.